TriMet and their partners are intending on taking $100 million from schools, public safety and other essential services to help fund Milwaukie Light Rail. The plan is to use Urban Renewal, for part of the funding. 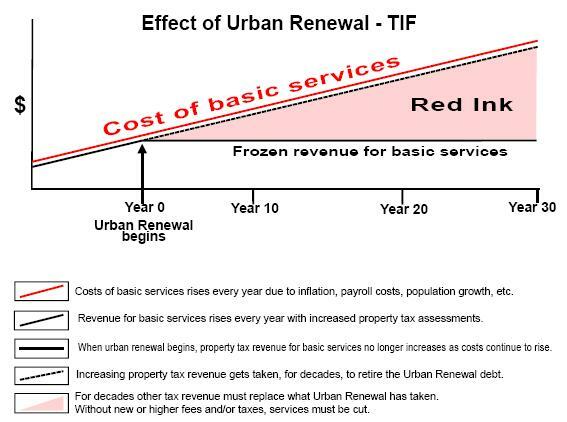 Urban Renewal now devours $60 million every year from the state common school fund. Enough for 800 teachers. A new report from the Portland Development Commission (PDC) projects a taking of $163 million from Portland Public Schools over the next 5 years. With the PPS district announcing a need of $1/2 billion in levies for building upgrades taxpaying voters deserve to know where millions in school funding goes. Does the public want school money spent on light rail? Millions will be taken, again, from the State “common school fund” to pay for Milwaukie Light Rail. This in addition to hundreds of millions in lottery profits for the project. The PDC spread sheet details how Urban Renewal diverts millions from Portland schools. The NEA, “The National Education Association” has long been critical of Tax Increment Financing (see here). With cities and counties adding more UR districts and use of Tax Increment Financing the statewide loss of school funding will grow. Some taxing jurisdictions are now stepping up and opposing the diverting of their resources. Public Safety jurisdictions have recently opposed this type of Urban Renewal financing. This week, the Clackamas Fire District board adopted their new Urban Renewal policy which is similar to the one also adopted by Tualatin Valley Fire and Rescue earlier this year. Schools, other agencies and the public need to join public safety in opposing this type of Urban Renewal financing. Understanding the connection between the announced $1/2 billion needed PPS building repairs and the $1.5 Billion Milwaukie Light Rail should trigger that added opposition.